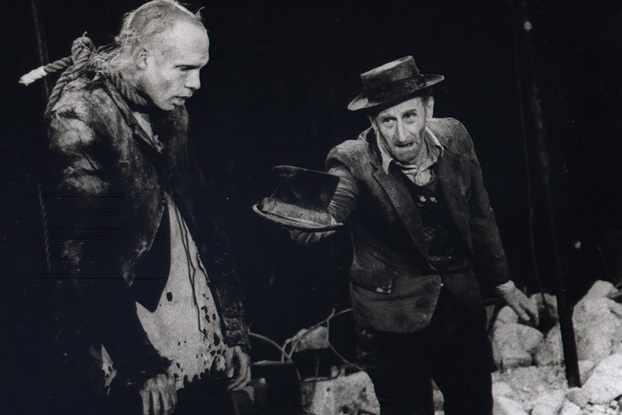 To celebrate the coming together of actors Richard Roxburgh and Hugo Weaving and director Tamas Ascher for what promises to be a vibrant, entertaining production of Samuel Beckett's Waiting for Godot, we take a look back at some notable productions of the tragicomedy of Vladimir and Estragon. The play was given a trial on French radio in 1952, with Beckett absent from proceedings, and the first theatrical performance was on 4 January, 1953 at the Théâtre de Babylone in Paris to generally positive acclaim, although some audience members revolted against the absurity of the drama. The premiere season was directed by Roger Blin, who also played the role of Pozzo, and who went on to direct premiere seasons of Beckett's later plays Happy Daysand Endgame, as well as Jean Genet's The Blacksand The Screens. The English language premiere of Waiting for Godotopened at the Arts Theatre in London on 3 August, 1955, directed by a young Peter Hall and coolly received by critics and audiences alike. The production was significantly censored, due to the laws of the time, and it was not until 1964 that an uncensored version of the play was professionally performed in London. 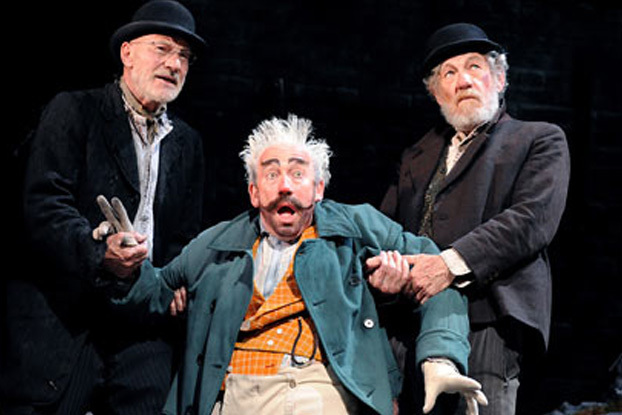 A revival of the play starring Rik Mayall and Adrian Edmondson was performed on the West End in 1991, followed by a highly acclaimed production starring Sir Ian McKellen and Sir Patrick Stewart opened in 2009, also starring Simon Callow as Pozzo. 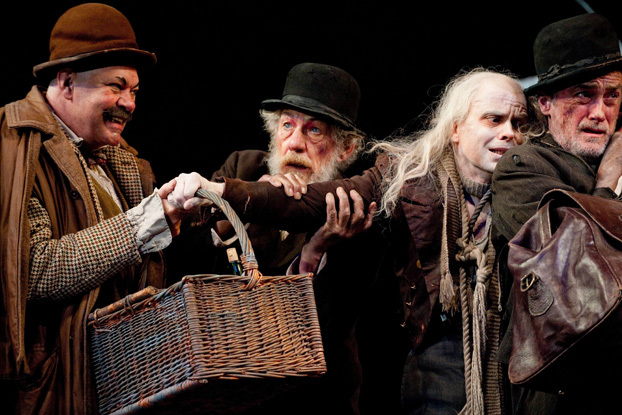 The production then toured internationally, including a season at the Sydney Opera House and at Melbourne's Comedy Theatre (where McKellen was mistaken for a beggar when taking a break outside the theatre), with Roger Rees replacing Stewart as Vladimir, Matthew Kelly taking over as Pozzo and Brendan O'Hea playing the hapless Lucky. The US premiere of the play took place on 3 January, 1956, at the Coconut Grove Playhouse in Florida, where is was poorly received before being mounted on Broadway to greater acclaim. 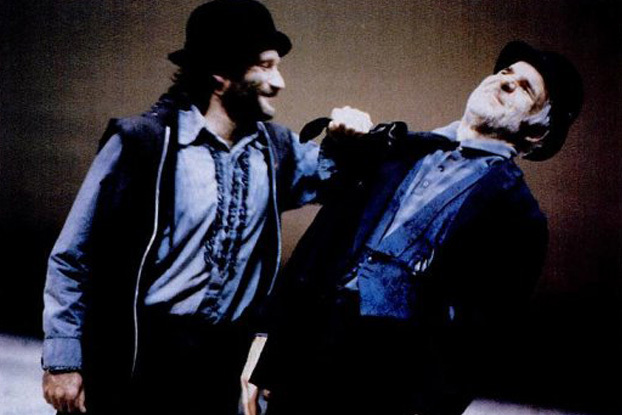 In New York, a 1978 production starring Sam Waterstone and Austin Pendleton opened at the Brooklyn Academy of Music, followed a decade later by a production at the Lincoln Center starring Robin Williams and Steve Martin, and directed by Mike Nichols. Although not particularly well received by critics, this production was popular success, with most tickets selling out to members of the theatre, making single tickets extremely hard to nab. In 2009, a Broadway revival was produced by Roundabout Theatre starring Nathan Lane and Bill Irwin (who played Lucky in the 1988 Lincoln Center production) and it was nominated for three Tony awards. In Australia, a notable early production starred Geoffrey Rush and Mel Gibson, before the latter took off to try his luck in Hollywood. At Belvoir in 2003 a production was directed by Neil Armfield, and was originally going to star Rush, but it was recast to star John Gaden and Max Cullen, with Steve Le Marquand as Lucky (pictured). 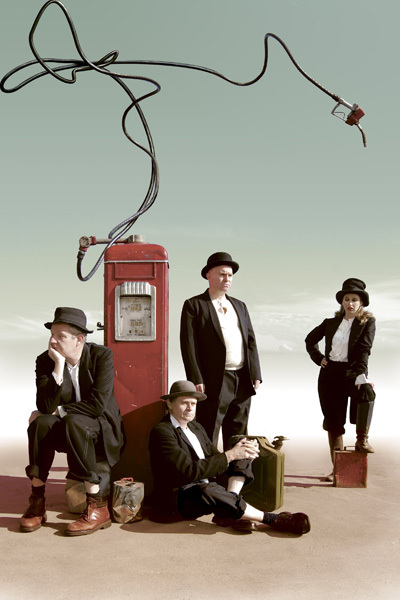 At STC, our production next year of Waiting for Godotwill be our first crack at Beckett's masterpiece, although The Wharf Revue did their take on it in 2008 with Waiting for Garnaut. 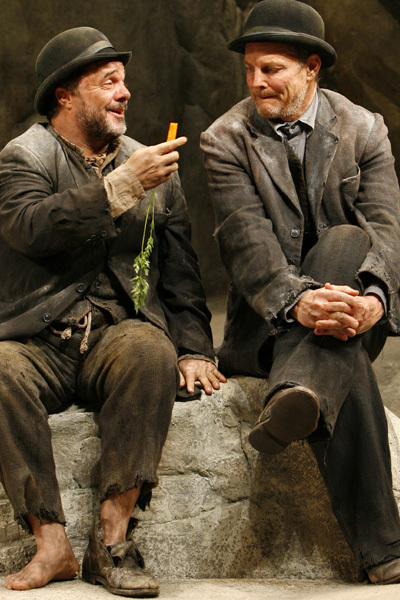 Waiting for Godot, 16 Nov - 21 Dec 2013, Sydney Theatre.